Today’s post is about two top marine animal considered best for 2011 from two main perspectives: emerging commercial importance and evolutionary bests. Which of the animals below is the target of an emerging California fishery? Which of the animals was judged just fifty years ago as suitable only for bait and fetched $13 a ton, but today is California's top fishery both from a commercial and landed tonnage viewpoint? Which of all of the animals featured could be judged an evolutionary best? Both 1, the Pacific Hagfish, and 2, Kellet's Whelk, are the two latest fisheries classified "emerging" by the California Fish and Game Commission in accordance with Section 7090, Fish and Game Code. Emerging implies first, that new trends in fishing and consumption are targeting these species; and second, adequate management regulations are not in place to ensure sustainability. Santa Barbara is one of the most important West Coast harvest area for both. Fifty years ago more or less, fishers considered whelks to be pests, crawling into lobster or crab traps and stealing bait. In 2010, views changed: 67.5 tons of whelk were landed with an ex-vessel value of $117,000. Fifty years ago hagfish were also considered nuisances, as they too not only stole bait from crab traps, but burrowed into debilitated fish eating them from the inside out. In 2008 California commercial landings of Hagfish exceeded 900 short tons. Ex vessel price (before any processing) averaged about $.95 a pound over a ten year period, but could sell for over $20 a pound in Korea. Fifty years ago squid was sold by fishers for $13 a ton (ex-vessel value in the Monterey area, where, as a kid, I sold bait for deep sea fishing off the Santa Cruz Municipal Wharf) Today market squid constitutes the number one fishery in California, with over 100,000 tons harvested in 2009 for an ex-vessel value of $56.5 million. This is paradigmatic of what has been called"fishing down the food chain". For fishers, that implies that top level predatory food fish like blue-fin tuna or salmon are not present in sufficient numbers to warrant commercial fishing. These predatory carnivorous fish have been among the most desirable seafood for the past few thousand years, preferred for taste, ease of preparation, and food pounds per effort expended. Today California market squid is increasingly used in upscale dishes. It is exported to 36 countries, with China the leading importer. 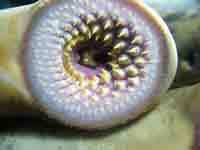 The species whose mouth is imaged as #4. is a lamprey, often considered a sister group to the Hagfish, and also relatively without adaptations over the past several hundred million years. 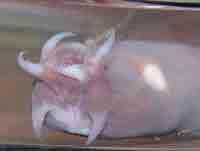 Both the white sturgeon (5 ) and the Hagfish (6. & 1.) could be considered evolutionary bests, as both are considered evolutionary fossils, almost unchanged over the past two to 500 million years. Unchanged means that in order to have survived, both have been doing something very right in evolutionary terms. What can top level species in the cognitive niche learn from these bottom dwellers? Both appear to be well adapted to their environments ( ocean sediments), which have have changed relatively little over the past 500 million years. Both are bottom dwellers and opportunistic feeders. Each has a good defense mechanism to avoid being eaten. Hagfish are the masters of slime effusion, which is massively produced whenver they are agitated. This protein-based mucus contains silk-like fibers possibly even superior in performance to spider threads, thought to powerfully clog up the functional aspects of would-be predators. Whelks also secrete mucus when agitated. In additio, whelks are protected by thick, twisted shells, into which they can readily crawl to escape predators, with a shape that promotes rapid burrowing. Further, whelks have the ability to repair damage to their shells. 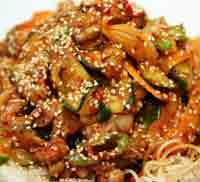 The key ingredient in the Korean stir fry dish pictured in 7 is Hagfish: Kkomjangeo bokkeum (꼼장어 볶음), Korean stir-fried fish dish made with the hagfish Eptatretus burgeri. In 8, whelk is prepared in a spicy whelk with noodles dish. Bouillabaisse is a traditional seafood stew from Provençal, France, blending typical Mediterranean spices such as saffron, fennel, and garlic with a large variety (classically at least nine) of non-oily fish and other marine organisms including lobster, scorpion fish, sea urchins, clams, turbot, monkfish, sea robin, mussels, bream, conger, octopus and squid. Because of the extent of seafood ingredients, bouillabaisse has become a gourmet dish. For the purpose of this post, what distinguishes bouillabaisse for me from the stirfry is this: A good bouillabaise retains and elevates the flavors of fresh, individually distinct seafoods, accented by spices; whereas both stirfry dishes pictured highlight the spices. Any number of sea organisms could be used as the "key" ingredient, from squid to Hagfish. Haggis is a traditional Scottish meat stew made from the offal of sheep: heart, kidneys, and lungs. Haggis often connotes a poorman's stew, but on recent occasion, as labor becomes expensive, haggis also may indicate a delicacy. What the title of this post suggests is that fishing down the food web (chain) necessarily correlates with eating less desirable seafood: selecting animals lower and lower in the food web for consumption as best-choice animals are fished out at higher trophic levels. As this happens, spices and preparation will become increasingly important, while key seafood ingredients retreat into a spice and vegetable mix. This might be termed "greening down the food chain", as vegetables and spices dominate the taste of dishes lacking higher trophic level marine organisms. The lowest trophic level is not necessarily the least appetizing but rather the level of primary productivity, which is where plants and phytoplankton and algae convert though photosynthesis non-organic matter into sugars and food for consumer at the higher levels. Primary production is the sine qua non for life on earth. Homo sapiens and other apex predators are incapable of surviving without the foundation of primary producers. Consumers at upper levels consume the products of primary producers and whatever eats them, meaning herbivores eating the plants and then carnivores eating the herbivores At the highest level of the food ladder are the apex predators, such as Homo sapiens, polar bears, wolves, and toothed whales. Apex predators tend to be carnivorous, often cannibalistic, while bottom level species tend to be scavengers and decomposers, eating dead and decomposing marine organisms.Not surprisingly, apex predators tend to eat fresher food than organisms very low on the food chain, who wind up dining on dead or dying animals. Insofar as you are what you eat, higher trophic level organisms tend to eat fresher food that is gastronomically more appetizing. Whelk eat both carrion and small marine animals such as tube worms, mussels, and barnacles. Hagfish are opportunistic bottom feeders, meaning they will eat just about whatever they can find in bottom sediments, which turns out to be primarily dead and dying marine organisms. 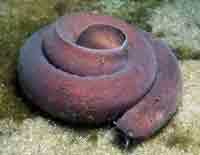 Neither the whelk nor the Hagfish swims to hunt for food. Both are bottom dwellers, eating either what lives or dies at the bottom or falls to the bottom as detritus. Neither is a muscular predator, characteristic of apex level predators and preferred foods. So the classification of Hagfish and whelk as emerging fisheries reflects changes in the quality of food that (most likely) we will eat n the future. Slime eel is the common name for Hagfish, which is an ancient unfish-like fish that is abundant in the Greater Santa Barbara Ecosystem (GSBE). Aside from having survived relatively unchanged over the past two to 500 million years million years, making Hagfish a living fossil, these animals are remarkable both physically and economically. They are the only living animals that have a skull but lack vertebral columns, are jawless, have no eyes, and four hearts.They are ancient, but they are doing some things right. So to summarize this post: We are eating down the food chain, but not at the absolute bottom. The two emerging fisheries of Hagfish and whelk need management, as do all other fisheries, both commercial and recreational. It's not too late for informed management, which starts at the local level of each individual's every action of consumption. The next post will feature aphrodisaic seafood paired with local, ecologically produced wines.